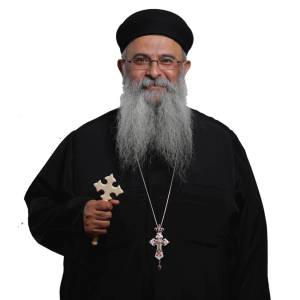 Father Shenouda Roshdy Ghattas was born in Egypt on August 8, 1959. He came to California February 1978 at the age of 18. He earned a Bachelor of Science Degree from the California State University at Long Beach in 1983 in Electrical Engineering. He worked as an Electrical Engineer from 1983-1986 and served as a Deacon and Sunday School Teacher at St. Mark Church in Los Angeles for 10 years. His Holiness Pope Shenouda III ordained him a Presbyter on June 7, 1987 in Cairo. He served at St. Mary Church in Raleigh, North Carolina in 1987-1989, and at St. Abraham Church in Long Island, New York from 1989-1991 and at Archangel Michael Church in Ventura from 1991-2005. He currently serves at St. John Church in Covina. On March 10, 2016, His Eminence Metropolitan Serapion elevated Fr. Shenouda to the priestly dignity of Hegumen during the Clergy Meeting at St. Pope Kyrillos VI Church.